A clarification: Harry Bristow-Holmes at Sunseeker London sold the 24.97m motor yacht Samana to a direct client with no other broker involved. 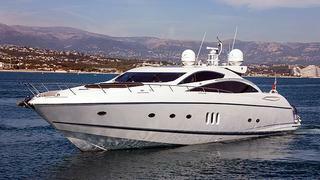 A Sunseeker Predator 82, this speedy superyacht was built in 2006 and is MCA compliant. Accommodation is for eight guests in a full-beam master suite, VIP stateroom and two twin cabins while twin MTU V16 2000 M91 engines power her to a top speed of 43 knots. Her saloon has a unique rotating glass sunroof, which opens to allow fresh breezes and natural light to filter through. Samana was asking €1.1 million and is heading to the Middle East.